With the holidays upon us, busy professionals like you may crave a sumptuous home-cooked meal or want to throw a fabulous soirée, but don’t have the time (or motivation) to plan, prepare and execute. This season, consider hiring a private chef! Depending on your needs, private chef services can range from meal planning, grocery shopping and meal preparation to creating a dazzling special event in your home or workplace. LA has some great resources, including celebrity chef agencies, private in-home cooking classes, and even gluten-free and vegan options. You may remember Big City Chefs from the reality show Private Chefs of Beverly Hills on The Food Network. Although this tasty docu-soap was cancelled, Big City Chefs is still cooking up a storm, staffing hand-selected, restaurant-quality, and celebrity private chefs for fine dining experiences, all with a touch of culinary theatrics. 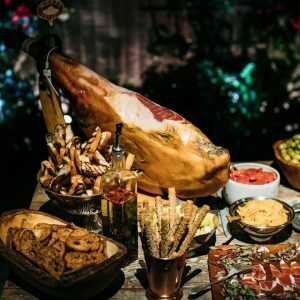 Whether you’re looking to host an unforgettable dinner party or hire a chef for long term private placement, the agency will personally match you with the perfect hand-selected, restaurant-trained private chef for your needs. 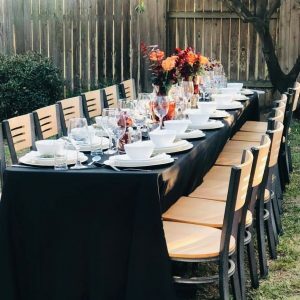 Custom Crafted Dinner Parties include Rat Pack Dinner, Romantic Dinner for Two, Girls’ Night Out, Wine Country Dinner, or create your own theme. Big City Chefs also offers Custom Cooking Classes and Weekly Menu Planning. Haute Chefs LA is a single resource for boutique private chef services, stylish catering, and chef-prepared meal delivery. Founder/Owner Chef Jeffry Nimer is a James Beard-nominated chef who ventured from top culinary positions into the private chef sector, and has been the go-to private chef for Forbes list regulars and celebrity clientele ever since. 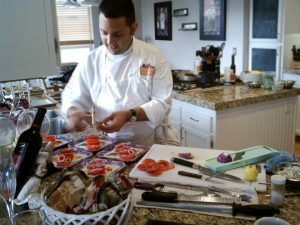 A Miami native of Lebanese background, Chef Nimer is known for experimenting with Middle Eastern and Latin-influenced ingredients, and the skill of perfecting recipes with seafood. Not to mention a mean salsa move or two! The core of Haute Chefs is the Private Chef Experience, providing personalized luxury private chef services in your home or the location of your choice. A-List clientele includes Nicole Richie, Bruno Mars, Jessica Alba, Jason Stratham, Ben Affleck, Kirsten Dunst, Sumner Redstone, David Geffen and Jennifer Lopez. Ever wanted to take a cooking class with a professional chef? Learn how to make the perfect homemade pasta, decadent chocolate desserts, luxurious Spanish paella, and more with Cozymeal, a leading provider of culinary experiences. Cozymeal brings you top local chefs with expertise ranging from Michelin-starred restaurants to best-selling cookbook authors and celebrity personal chefs. All chefs are vetted in person to ensure that the highest standards are met, including requirements for food safety certifications. Cozymeal experiences are hosted at the chef’s place or yours. To have the chef come to you, simply select “My Place” when booking. Chef’s locations are all pre-approved and range from premium venues to event spaces and private homes. At the end of the class, everyone sits at a table and enjoys the dishes they have prepared together. A private home chef based in Santa Monica, Emily Turner specializes in gluten free, vegan, as well as allergy friendly cooking. Working with a variety of dietary needs, Emily will come into your home and create fresh, healthy meals that even the carnivores in your life will love. A health and nutrition activist for over 20 years, Emily studied plant-based nutrition at the New Mexico School of Natural Therapeutics and has a broad and extensive knowledge of raw food cooking, western herbology, polarity, aromatherapy, flower essences, homeopathy, massage, and sports therapy. Her specialty is making comfort food that’s surprisingly healthy and nutritious, with unique menus culled from Thai, Indian, Asian. Mediterranean, Ethiopian, Italian. Middle-Eastern, Mexican, American, Raw Food, Vegan, Vegetarian, Gluten Free, Plant-Based, Allergy Friendly, and many other requests. For more questions about private chefs, including prices, contracts, staffing, insurance, and references, check out these tips from Angies’ List.